Palm Beach County Democrat and political powerbroker Andre Fladell is as angry at CNN’s fake news as Donald J. Trump. And, it sounds a little different when it’s coming from one of the most powerful Democrats in the Sunshine State. “What’s hurting the country the most, in my opinion, is the dysfunctional and disgusting reporting of a cable channel called CNN,” Fladell said during a meeting earlier this month of the United South County Democrats. 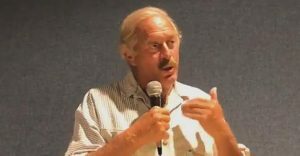 Once awarded the honorary title of “Prince of Palm Beach” by the county’s commissioners, Fladell is a legendary political operative recognized across Florida, in part for the way he united six warring Democrat clubs and establishments into a united faction: the South County Political Cooperative. His history is a fascinating one, to say the least. Fladell rightly noted that both MSNBC and Fox News at least admit their biases up front. “Chris Mathews, Chris Hayes, Hannity, Tucker Carlson, Laura Ingraham, Al Sharpton — they don’t pretend to be news. They pretend to be commentators,” he said. He then listed a bevy of examples to back up his argument, such as when CNN (and in fact the entire left-wing media) tried to score a gotcha’ moment on National Security Adviser John Bolton by revealing what he had written on his legal pad to the entire world.